New Matilda columnist Dr Lissa Johnson joins the #MAYhem, to explain why she writes for Australia’s most stubborn independent media outlet. If the parlous state of Western media was ever on full display, it has been lately. From sanitising massacres of Palestinian protesters to bolstering the silencing of Julian Assange, the media has some serious charges to answer. In the UK, faced with gaping holes in their narratives during recent weeks, major media outlets went into melt-down over journalists, academics and others departing from the official scripts on Syria and the Salisbury poisoning. The desperate, dogged defence by media institutions of their own fragile groupthink has been remarkable to behold. During a BBC interview on the alleged Douma attacks, for instance, former First Sea Lord, Admiral Lord West, advocated seeking accurate information before taking military action, whether in Syria or elsewhere. Despite the obvious prudence of his suggestion, the BBC presenter interviewing Lord West took umbrage at his stance. She found it “inadvisable” to say such things “so publically”. West had gently pointed out that terrorist-embedded sources, such as those supplying intelligence on Douma, are not the most reliable. He added that when he was Chief of Defence Intelligence himself, he had been “put under huge pressure… politically” to lie about the UK’s bombing campaign in Bosnia, alluding to the dangers of politicised intelligence. Casualties at Douma last month, from the ongoing Syrian civil war. With US president Donald Trump citing discredited Israeli intelligence as a basis for withdrawing from the Iran nuclear deal, stoking fears of regime change war against Iran, the dangers of politicised intelligence loom large as ever. Rather than exploring West’s striking revelation on Bosnia, however, the BBC interviewer’s “journalistic reflex”, notes comedian and commentator Jimmy Dore, was to remind Lord West of our “information war” with Russia, admonish the admiral for “giving credence to the Russians”, and shut him down. Quick smart. The Sky News presenter and her co-host displayed not a hint of qualm at forcing an ordinary British citizen to defend his own humanity, and nationality, live on TV, because of his opinions. It is an Orwellian day indeed when Sky News becomes the thought police, pursuing private citizens into their own homes, demanding that they defend their political views. Ian, for his part, handled the situation admirably, putting Sky News and the Guardian to shame. I hope his Twitter following and blogspot went through the roof. The BBC promptly followed Sky News down its Orwellian rat hole, airing a patronising, albeit more sophisticated, smear piece of its own. Ian responded on his blogspot here. 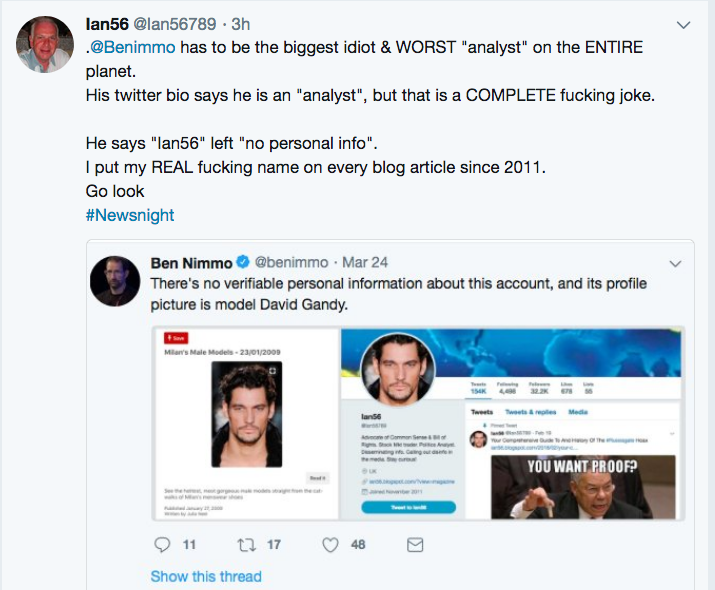 Ian, whose last name is Shilling, seems like a down-to-earth fellow who looks to be in his 60s or so. For a laugh, he had been using a photo of a famous male model as his Twitter avatar. Now, thanks to the relentless work of the Guardian, Sky News and the BBC, the truth is out. Ian Shilling’s hair has been exposed for what it is: thinning and grey, not the lustrous black mane his Twitter followers had come to expect. Sadly for Ian’s accusers, however, chief among them Theresa May according to the Guardian, this does not make Ian a Kremlin troll. If elites plan to shout “Reds under the beds!” every time someone uses a fake Twitter photo, they are going to be very busy. And if that’s the best they can do, after all these months trawling social media for Russian disinformation, then they are clutching more desperately at straws than even many sceptics imagined. Douma, in Syria, pictured during the Syrian civil war. The crowning glory of the Douma coverage was a CNN reporter on the ground in Syria sniffing a backpack for lethal chemical weapons, live on air. No hazmat suit, no gloves, no mask. After taking a good whiff she said, “There’s definitely something that stinks”, fanning her nose and pulling a face. She did not, however, pass out or drop dead. Like her Sky news colleagues, the reporter appeared so accustomed to peddling nonsense on TV that the ludicrousness of her stunt had escaped her. In an effort to reinforce the paper-thin pro-war line on Douma, the front page of The Times and articles in the Guardian, the Huffington Post and BBC smeared a range of dissenting professors, academics, investigative journalists and bloggers, all of whom had called for investigation and evidence on Douma, as Assad apologists, conspiracy theorists, Russian bots and Kremlin trolls. Oh. That’s okay then. Unquestioningly parroting a government line. Whether it’s accurate or not. Forcing a private citizen to publically defend his personal views. Because the government doesn’t like them. Solid work. In the United States, CNN smeared Jimmy Dore, who also sought truth and fact on Syria, as an ‘extremist’, comparing his show to ISIS, neo-nazis and paedophiles. In Australia, the Sydney Morning Herald equated calls for investigation and evidence to Russian treachery. Now, a fact-finding mission of the UN Organisation for the Prohibition of Chemical Weapons (OPCW) has determined that Chlorine gas was likely used in Idlib, Syria this year. The finding is based on samples provided by jihadists according to RT and former British Ambassador to Syria Peter Ford. It will be interesting to see whether those questioning the reliability of jihadist-linked sources are deemed Russian-bot-Twitter-trolls again. For me, the whole ham-fisted effort by media organisations to enforce a singular pro-war narrative illustrates processes described by Professor Peter Phillips and colleagues of Sonoma State University. The group released a report in 2017 on the machinations of contemporary mainstream media and its relationship to power: specifically to governments, corporations and the military. The Sonoma University report described a news process in which the majority of contemporary ‘news’ is fed to media organisations by public relations and propaganda (PRP) firms. These firms issue press releases and talking points on behalf of their clients, which include governments, militaries, arms manufacturers, the Pentagon, private companies and anyone with millions of dollars to spare. It is a multi-billion dollar industry annually. Given Phillips and colleagues’ assessment, the recent tailspins across mainstream media outlets can be understood not as Russian propaganda versus the West or Assad apologists versus the rest, but the multi-billion dollar PRP industry versus old fashioned journalism and news. One upshot of the 2017 report is that, in 2018, it is anachronistic to consider the mainstream media’s primary function to be that of news. According the Sonoma University report, over 80 percent of what we consider ‘news’ is not news or journalism at all. Its is PR. . The implication is that mainstream ‘news’ is only 20 percent informative, and 80 percent misleading. Or distracting, as the case may be. Which amounts to an 80 percent waste of time. Granted, the 20 percent real journalism can be excellent. Outstanding even. Which only makes the whole mainstream media landscape more confusing, by casting a legitimate glow over the 80 percent which, according to Phillips and colleagues, is PR. While some of the PR that passes as news is diversionary fluff, existential issues such as climate change and war are more serious business for their stakeholders. The PR mission of war profiteers, for instance, is to get away with murder. Which poses quite a PR challenge. Tuning and transmitting messages about chemical weapons attacks, to justify missile strikes, is an example. Tuning and transmitting messages that Israel is Iran’s victim, laying the psychological groundwork for hostility against Iran, is another. (For exemplary investigative reporting on Iran, see investigative historian Gareth Porter. He tweets here). So who are the instigators of collective violence? Who tunes and transmits the messages to do harm? According to the psychology of atrocity, it is those who control the flow of information. In other words, the media. Another crucial psychological ingredient of collective harm, says peace psychologist Ervin Staub, is “the passivity of witnesses, internal bystanders who are part of the population.” Bystander passivity “affirms perpetrators and allows the unfolding of the evolution of violence”. Instigators of violence and their PRP firms understand this. Part of the PRP challenge for war profiteers (a group that includes Theresa May’s husband’s firm), is to prevent bystanders from speaking out. Publically branding opponents to war, such as dissenting academics and journalists – and Ian – as ‘apologists’ or ‘Russian bots’ is one approach. Wikipedia’s role in this process has also come under scrutiny of late. Wikipedia is charged with selectively editing its pages so as to discredit anti-war voices, helping the pro-war PR machine to do its job. The problem facing media instigators today, however, as evidenced by their heavy-handed approach to Douma and Salisbury is that they are losing their grip. According to a Pew Research Centre poll in 2015, only 37 percent of 18-33 year olds in America watch TV news on any given week. The majority of younger viewers get their news online. Which makes it trickier for elites to control the narrative. The median age of cable news and CNN viewers is 60. The median age of Fox News viewers is 65. Age-related patterns are similar in the UK. Trust in media is also at an all time low. While this has fostered public confusion over which news is credible, not everyone is equally bamboozled by Russian-bot scare campaigns. More digitally-oriented consumers express more confidence about which sources to trust. No longer able to win contemporary, younger, digitally-oriented audiences via soft power (that is by doing a good job), governments and their PR apparatuses are resorting to more suppressive tactics. In addition to McCarthyism, smear campaigns and soft boycotts on truth and fact, there is the resurgence of blacklists, ministries of truth, suppression of independent voices by Google, Facebook and Twitter and, now, the silencing of Julian Assange. If the PRP machine succeeds in fostering our passive complicity in the arbitrary detention, solitary confinement and slow death of a publisher for journalism, we can only expect more of the same, for others, to come. In Australia, for instance, the Government has proposed legislation that threatens to criminalise public interest journalism. The bills under consideration, the ‘foreign interference’ legislation, include penalties of life imprisonment for “activity regarded as a threat to the existing political and economic order” and 20 years’ jail for “divulging or circulating any information deemed ‘harmful’ to Australian security or economic interests”. All of this leads me to why I write for New Matilda, and why I am writing this article now, as part of New Matilda’s current fundraiser. Amongst all the doubt-sowing and confusion-mongering over which sources of information to trust, there is one simple question that media consumers can ask themselves to navigate towards real news, through the PR maze. Who benefits? Where there is substantial corporate or government money behind a news outfit, there is someone with a stake in what is being said. In the contemporary Western media environment, where that stake is significant, odds are that a PRP firm is involved. New Matilda, as a reader-funded endeavour, depends on its readers, not backers with deep pockets and PR firms, for survival. (In case you were wondering about the Guardian’s funding arrangements, the following title holds a clue: ‘Guardian sells space to war-profiteers to promote war’). Wise to the journalistic trap that is great gobs of government cash, New Matilda editor Chris Graham declined last year to apply for a government grant under Senator Nick Xenophon’s $60 million ‘innovation fund’ for small publishers. It was a decision taken at significant personal cost to himself, and to New Matilda contributors. Most New Matilda contributors are unpaid. Chris Graham draws no wage from New Matilda. Chris wrote at the time, “The Turnbull government is going to spend $60 million of your taxes buying a Senator’s vote to pass bad legislation designed to advantage some of the most powerful media corporations in the world.” He added that he didn’t “believe you fix modern journalism with government money, although it’s not like we couldn’t use some”. This makes New Matilda a media organization that puts its money where its mouth is. Rather than drawing a wage, its editor has committed to protecting the independence of New Matilda’s content. So why do I write for New Matilda, for free, like most other New Matilda contributors? One reason is that I have a day job, and don’t rely on writing for my income. Other writers, however, do. Even independent journalists need to eat and pay their rent. Which is one reason New Matilda needs your help right now. Chris Graham would like to pay New Matilda contributors for their hard work delivering real journalism and real analysis. And hire more regular writers. And perhaps even pay himself one day. As for me, the chief reason I write for New Matilda is the freedom I experience as a writer here. When I sit down to pen a piece, I am unencumbered by anyone’s opinions but my own. I can write whatever I like, on whatever topic I choose. There is no vested interest to protect, be it funding, access, advertising or government grants. You may not always agree with everything that New Matilda publishes. Chris Graham may not always agree with everything that New Matilda publishes. Unlike Sky News, the Guardian and the BBC, he has not appointed himself chief enforcer of the thought police. Which means that as a writer there is no editorial line to toe. I have no idea, for example, whether Chris Graham might find my assessment of the Guardian a little harsh. He may. He may not. He may have friends or colleagues at the Guardian, which might make it difficult for him to publish my piece. I don’t know. I’m not asked to worry about that. I just write. Which is the definition of independence. If you appreciate journalism that speaks truth to power, and writers who tell it like they see it, without fear or favour, please subscribe. If you would like to take a stand, rather than sit helplessly by as PR firms whitewash the world, setting new benchmarks in the demolition of basic democratic rights, now’s your chance. Six dollars a month may not seem like enough to make a difference, but it is. It makes all the difference.